A comprehensive analysis of 101 major earthquakes around the Pacific ring of fire between 1990 and 2016 shows that most of the aftershock activity occurred on the margins of the areas where the faults slipped a lot during the main earthquakes. The findings support the idea that the area of large slip during a major earthquake is unlikely to rupture again for a substantial time. The idea that earthquakes relieve stress on faults in the Earth's crust makes intuitive sense and underlies the common assumption that the portion of a fault that has just experienced an earthquake is relatively safe for some time. But not all studies have supported this, according to Thorne Lay, professor of Earth and planetary sciences at UC Santa Cruz. "This intuition has been challenged by statistical treatments of seismic data that indicate that, based on the clustering of earthquakes in space and time, the area that has just slipped is actually more likely to have another failure," Lay said. "The truth appears to be more nuanced. Yes, the area that slipped a lot is unlikely to slip again, as the residual stress on the fault has been lowered to well below the failure level, but the surrounding areas have been pushed toward failure in many cases, giving rise to aftershocks and the possibility of an adjacent large rupture sooner rather than later." 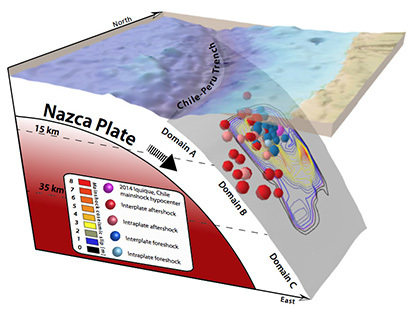 In the new study, published February 14 in Science Advances, Lay and other seismologists at UC Santa Cruz and Caltech took advantage of advanced slip-imaging methods applied to recent earthquakes of magnitude 7 or greater. When they examined the locations of aftershocks with respect to the slip during the mainshock, they found that very few aftershocks occur in the regions of a fault that had a large amount of slip, and aftershocks that do occur in the slip zone tend to be weak, with negligible additional slip. Most aftershock activity occurs on the margins of the area that slipped in the mainshock. "This produces a halo of aftershocks surrounding the rupture and indicates that the large-slip zone is not likely to have immediate rerupture," Lay said. These findings indicate that the stress reduction during a major earthquake is large and pervasive over the ruptured surface of the fault. Stress will eventually build up again on that portion of the fault through frictional resistance to the gradual motions of the tectonic plates of Earth's crust, but that's a very slow process. Although immediate rerupture of the large-slip zone is unlikely, regional clustering of earthquakes is likely to occur due to the increased stress outside the main slip zone. The findings also suggest that if unusually intense aftershock activity is observed within the high-slip zone, a larger earthquake in the immediate vicinity of the first event might still be possible. The authors noted that earthquake sequences are highly complex and involve variable amounts of slip and stress reduction. In addition to Lay, the coauthors of the paper include first author Nadav Wetzler, a former postdoctoral researcher at UC Santa Cruz now at the Geological Survey of Israel; Emily Brodsky at UC Santa Cruz; and Hiroo Kanamori at the California Institute of Technology.